Welcome to the future of showering. Experience precise flow and temperature control at your fingertips. Feel the sensation of both shower heads working at once. Enjoy a showering experience that’s personalised to you. With our Mira Vision Dual, there’s no need to compromise. 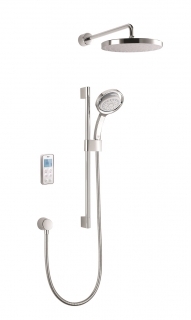 Combine the practicality of the Mira 360 shower head offering 4 unique spray experiences, and the spa-like coverage of the deluge head. Or better still, experience both at once.